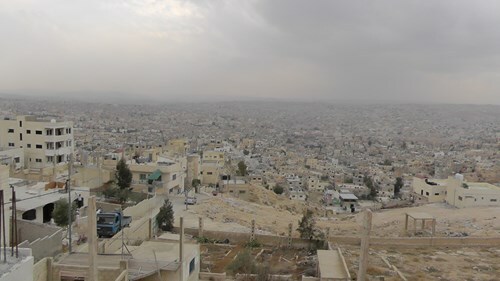 The purpose of this trip was to meet Syrian families living in the cities of Jordan, listen to their stories and ensure that we have a relevant response in place. In addition to this we wanted to meet our Jordanian partners who agreed to accept and distribute the container of clothing we recently shipped. I have to say that the Jordanian team were truly outstanding and the respect they have earned among the Syrian families is noticeable and commendable. For security reasons I will not identify our partners and the Syrian families, but their stories are real and overwhelming. Emotions ran high as we heard harrowing accounts of the brutality of war, courageous tales of survival and the pain of living in a state of limbo, wanting to return to their homes. Just heard a harrowing story. I don’t know if this is a good or bad thing but every one of the fifty families we visited said we were the first team to visit that not only brought aid, but took the time to simply sit, listen and treat them as normal people. This simple act of love opened their hearts and we shared the most precious moments together. My heart is forever linked with these amazing people.